Students harvest carrots at the Institute for Food farm. The Institute for Food offers a variety of internships for those who desire to create change in the local food system. These internships are available to students who have taken IES 278 - Introduction to Food Systems or by permission of the advisor to the Food Systems and Food Studies Co-major. Typically, interns exhibit a strong interest in the workings of the farm and often have some previous farming or gardening experience. Students interested in an internship with the Institute for Food may request information from Dr. Peggy Shaffer (shaffems@MiamiOH.edu). 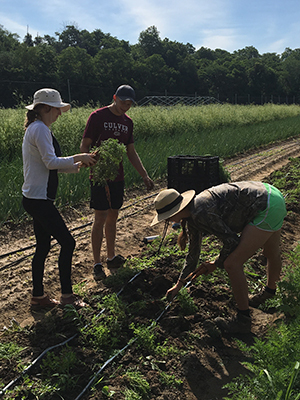 In Fall 2016, the Institute for Food Farm hosted 3 interns. Internship Focus: "As a graduate intern for the Institute for Food, my role spans between my apprenticeship on the farm and working as local food sourcing coordinator at Miami's Culinary Support Center. I act as a liaison between the farm and the university's Dining Services. This includes finding ways to use our farm's produce in campus dining halls, at university catering events, and even at 'convenience store' locations on campus such as MacCracken Market." Why I'm Passionate About Local Farms: "I would say that I had a unique upbringing; despite the fact that both of my parents were full-time professionals, we always had a garden, goats, chickens, ducks, and geese. My grandfather was a farmer and my dad grew up on a farm, so my family kept this small-farm lifestyle in subtle ways. I've also always had a love of gardening and good cooking, but I don't think I really understood the deep connections between agricultural systems and ecological issues until I reached college. I believe small-scale local farms are crucial for making tangible, positive environmental change, and that's what I hope to do." Internship Focus: "I work out at the farm every Wednesday and Friday. My focus is to really learn and appreciate this amazing thing that Miami has created, and to understand both what is going on with food in our society and the holistic view of how important it is. I love getting outside of the classroom and having this experiential learning opportunity on the farm." How the Internship Impacts My Academic Career: "This internship has significantly impacted my academic career. I created my own self-designed thematic sequence that includes this internship, BIO 131 - Plants, Humanity, & Environment, and IES 440 - Contemporary Topics. I am so happy to be involved in this community and plot of land. Getting outside and doing physical work has been really rewarding for me, and I would encourage others to try it as well." Why I'm Passionate About Local Farms: "As I've gone through this internship, I've learned so much about how what we put inside of our bodies makes up our existence. It literally makes up who you are. This has led to my passion about local farms and the realization that creating organic, natural, flavorful food is so important, especially in today's society where many people don’t understand the negative impacts of our food system." Internship Focus: "My focus for the independent study/internship is to gauge and document public opinion and excitement about the addition of the Institute for Food Farm, essentially gathering market research. Additionally, I am partially responsible for the creation of the Food Safety Manual and other legal documents required to operate the farm." How the Internship Impacts My Academic Career: "I am getting the opportunity to use SQL [structured query language] coding that I have learned in my Information Systems and Analytics (ISA) classes to help create data queries. It is always a nice moment when you are able to transfer an academic skill to a real-life application. On a macro scale, I have been able to shadow Peggy Shaffer (the Institute Co-Director) and learn how to delegate and divide tasks to expedite the process. I would argue that Peggy Shaffer is one of the best delegators I have worked under." Why I'm Passionate About Local Farms: "As long as we we are alive, food will arguably be one of the most important commodities. I want to be a part of securing longevity in our food system in Oxford and hopefully one day, globally." The Institute for Food is a Provost Interdisciplinary Innovation project to engage the Miami University community around issues of food, health, and sustainable agriculture. Its mission is to foster healthy food, healthy eating, healthy communities, and a healthy planet.